Oddly enough, in the absence of this poll, I commended the diminuitive Jagdpanzer 38(t) "Hetzer" as being outstanding, just a couple of days back. It was only the size of the Pz II, but carried essentially the same gun as the Panther, and with similarly sloped armour that allowed it to shrug off hits (from the front) by the T34. Being so small, the ammunition storage capacity was limited, but when deployed from Ambush, it being so SMALL made it hard to detect, and it was both fast and mechanically reliable. It remained in service with both the Swiss and Swedish armies long after the war, and the Israelis tried to buy surplus Hetzers from the Czechs, but pulled out when offered (upgradable) Shermans at half the price. That's exactly why I made this poll. I didn't realize how small it was, I thought it was longer and wider.. The Panther was an outstanding tank, the best of the war. The STUG was such a simple and versatile SPG / TD that was easy to make and available in large numbers. That is a bit of oversimplification. 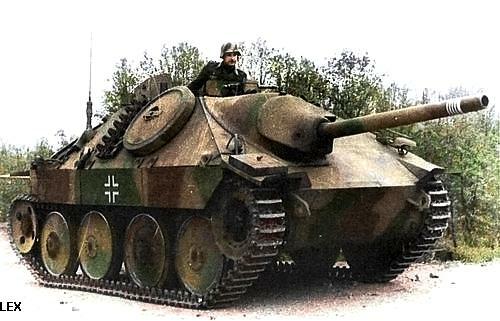 The Hetzer was indeed an excellent tank destroyer but did NOT have essentially the same gun as the Panther (75mm/71 cal) but it was the same as the Pz IV "special" (75mm/48 cal). I agree . While the tank was developed in reply to the T34,and based upon its sloping armour , the Panther was far more advanced than the crudely made tt34 . Unfortunately , this was also the Panther's downfall. It was much more costly ,and took much longer to build than the T34 . If the Germans had anything like equal numbers to the t34s ,the outcome would have been vastly different . But would it have been ? The Panther required a complete overhaul every 600 miles, which meant taking it out of the line and repatriation to Germany.Thus, it was rare that there were no more than 500 Panthers at any one time over the vast expanse of the Eastern Front. Reliability is of far more consequence than any other factor in armoured warfare . What's the point of having a superior tank if it's absent from the battlefield ? THe Germans could never have achieved anything like equal numbers.